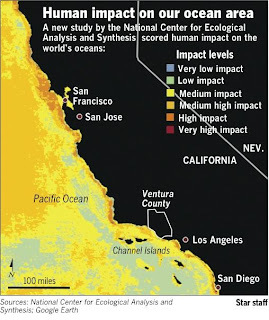 The March 22 article in the Ventura County Star summarizes a recent report that analysed human impacts on the world ocean. Turns out, there's not much we are not impacting, perhaps only 4%. And looking at the maps it is evident that human impacts are most intense in areas of high population density and industrial activity, including fishing. 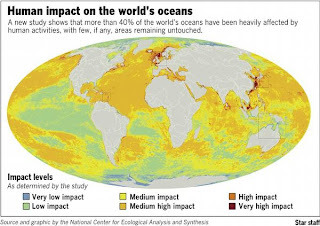 In 2005, the Joint Ocean Commission formally recognized the broad extent of human impact on the ocean, and made recommendations for the United States to take leadership action on the ocean crisis. The fundamental message is that current policy and governance is not working, and we need to adopt an Ecosystem-based approach to management decisions at every level of our society. Meanwhile, local folks around the world are working at the community level to implement change. It is clear that those who use and enjoy the ocean, its diversity of life, and the wilderness that begins at the shoreline, are willing to dedicate their time and energy. Surfrider Foundation activists embody this spirit, and are getting organized on the west coast. With programs in Washington, Oregon, and California, we have been working to develop community-led examples of Ecosystem-based Management. 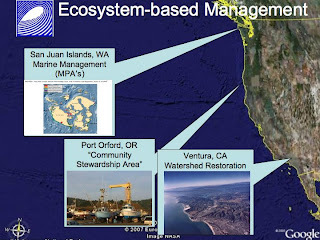 Each of these projects is very different, ranging from marine/fisheries management to watershed restoration. 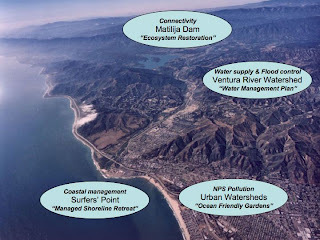 In Ventura, CA, our program includes coastal restoration, large dam removal, watershed management, and urban renewal. We recognize that each of these programs is integrally connected to the other, and the health of the oceans and our community depends upon finding solutions to undo past mistakes and create a sustainable future. We invite everyone to get involved in their watershed through our events and programs.